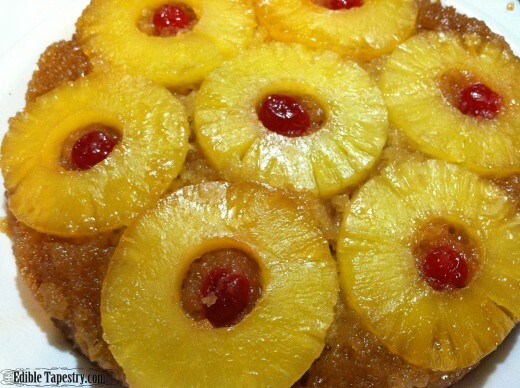 A Classic Pineapple Upside-down Cake ~ Dad’s Favorite! I made this cake for a picnic and fishing trip with my dad. He loves pineapple upside down cake. My younger son and I were standing on the river bank fishing when my dad walked past us to give us the fabulous spot he’d found, then moved off to find another for himself. He nodded, understanding completely. I love that my sons see how awesome he is too, and am very glad we made him his favorite cake for that special day out. Though I can use healthier alternatives to white sugar, brown sugar, and GMO white wheat flour in the dishes that I serve my family, there’s nothing I can use to replace the out-of-this-world red jarred cherries and canned pineapple that you need to make a traditional pineapple upside-down cake. Therefore, I have included them in this recipe. I am tempted, however, to see how just picked summer bing cherries and freshly peeled, cored, and sliced pineapple rings would taste baked into this cake. I guess I’ll be able to find out in a few months when bags of cherries appear in abundance in my local supermarket produce departments. I was pleased with the way this recipe turned out, despite the fact that I left Cake # 1 in the pan for too long which resulted in a big flop, literally. Not coming out…not coming out…FLOP! Cake # 2 cleanly left the pan when I inverted it onto a platter the second it came out of the oven. THE SECOND…and not a minute more (or second)! It’s been difficult in the past for me to come up with a moist yellow or white cake out of my head, but because a pineapple upside down cake is sopped with sugary, buttery goo, I’ll never know if this cake batter makes a dry cake or not. I guess that means mission accomplished. I guess… Dad was very happy with it. That’s all that mattered. Make the topping by placing the butter in a 9″ round cake pan and placing it in the oven to melt. 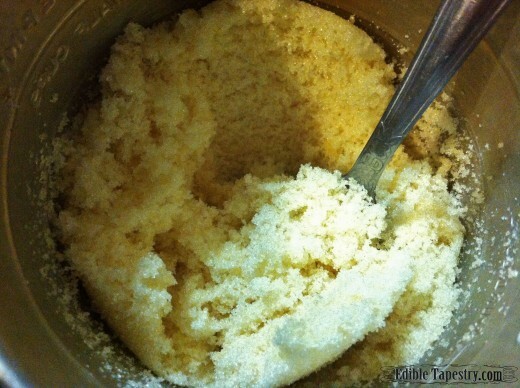 Mix together the sugar and sorghum. 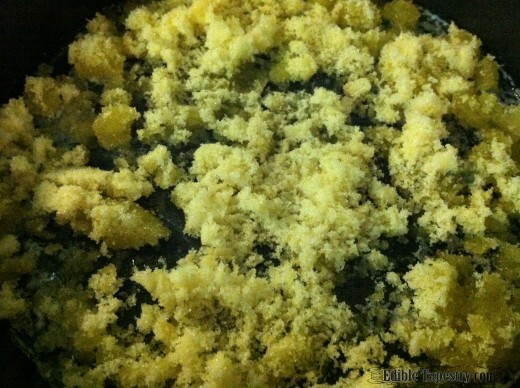 Sprinkle it over the melted butter in the pan. Return to the oven for a minute or two so that it can bubble but be careful to not let it burn. Remove from the oven and lay pineapple slices in a decorative pattern inside the bubbly sugar and butter. 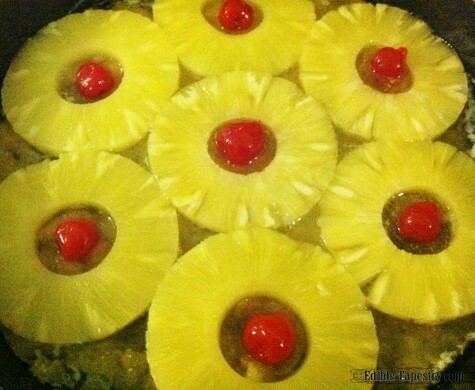 Add a cherry to the center of each pineapple slice. 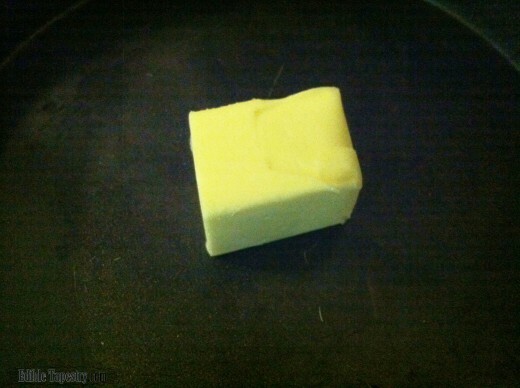 For the batter, cream the butter. Add the sugar and beat until well-combined. 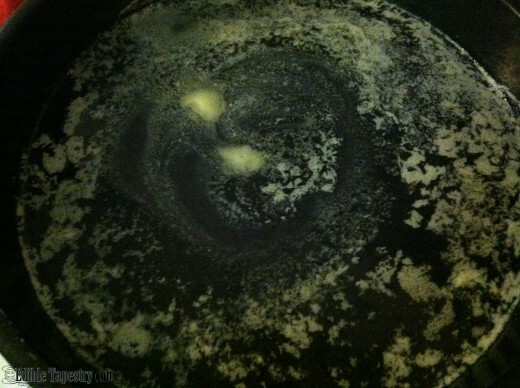 Add alternately with milk to the creamed mixture. Pour over the topping in the pan. Immediately invert onto a serving platter or cake stand. My daddy made an awesome pineapple upside down cake, in a cast iron pan. This recipe and story reminds me so much of my daddy. Thank you for sharing this. It is now on my list to bake. I’m so glad you liked it and it reminded you of him! He sounds like quite the baker from all the other things you’ve mentioned that he made. Now I just HAVE to try it in a cast iron skillet. My apple tarte tatin worked amazingly well in cast iron. Maybe I’ll try the fresh pineapple and fresh cherries in cast iron this summer. YUM.